Hospiscare’s Men’s Walk 2018 - the biggest and best yet! 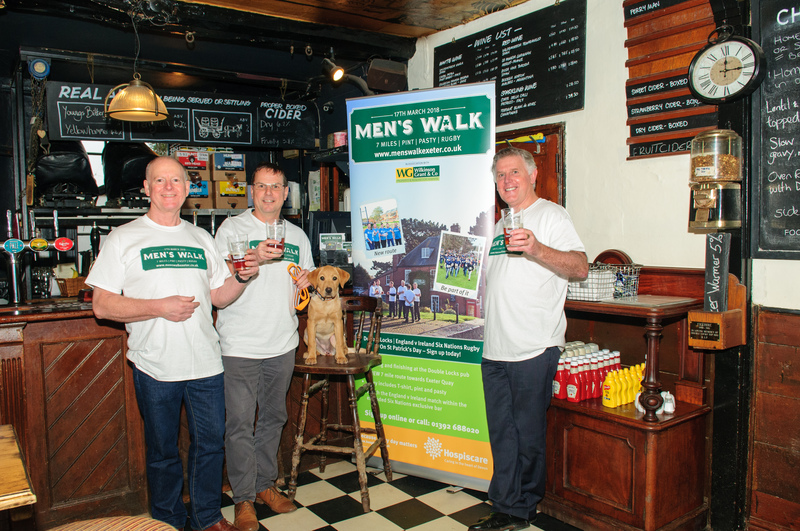 Hundreds of men will be putting their best foot forward for Hospiscare this month in the 2018 Men’s Walk. Tempted by the promise of live entertainment along the seven mile route with a free pasty and a pint while they watch the England v Ireland Six Nations rugby afterwards, walkers have made this a sell-out event again. Stalwart supporters of the Men’s Walk, Wilkinson Grant & Co, are once again the headline sponsors. Managing Director Roger Wilkinson said: “Wilkinson Grant & Co are delighted to sponsor the Hospiscare Men’s Walk for what is, for us, the fifth year in a row. In that time we are proud to have helped make the Men’s Walk such a great success and to become what is now - a fantastic community event that hundreds of people look forward to each year. Chunk of Devon will once again be supplying their delicious steak and vegetarian pasties for the walkers, and local matchmaking service, Pi Society, are also supporting the event.